The Ross Micro Genius RCG-200 (TXC) is a wireless Controller/Receiver pair for the Sega Mega Drive/Sega Genesis. I have one, but only one controller (the reciever supports two players/controllers simultaneously). Could someone please help me write or write a executor (HCS08 please; S3F80 would be nice as well if possible) for this protocol. All 3 parameters per function (nothing as a protocol parameter) would be most useful. I have tested the below IRP with IRScrutinizer, and generated learns, which do work. I did have a go with Protocol Builder, but I could not see any way of having the 1 burst start low as this protocol requires (like Xmit '0' Reversed, but for the 1 burst). This is the protocol used by the TXC Sega Mega Drive/Genesis IR controller, branded in the UK as the Ross Micro Genius RCG-200. Device is the player number: 1 or 2 under normal circumstances; 3 for Slow button; 0 invalid. Subdevice is the speed switch: 0 normally; 1 for speed (turbo) mode. 1 A; 2 B; 4 C; 8 Start; 16 Up; 32 Down; 64: Left; 128 Right. The Slow button sends both Left and Start with both player flags set (device 3), with all other bits varying based on controller state; To send just the slow button: D=3 S=0 F=72. The original controllers send a frame with F=0 for the relevant player/device when all buttons are released; however this does not appear to actually be necessary. Frame length varies by player/device on the original controllers, if D=1 frame length is always 13.5ms, if D=2 frame length alternates every frame between 6.8ms and 20.2ms. The IRP uses 13.5ms. Duty cycle of the original controller is 56.666%. It would help if you posted an IR or RMIR file containing learns, so that if someone were to try to re-create this, they'd have something to compare the test results to. I'm afraid I don't have any, none of the remotes I have managed to capture this. 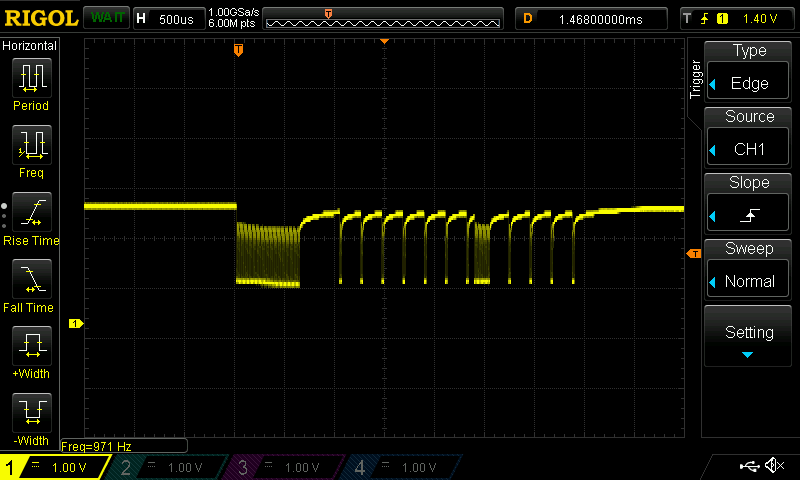 I built the IRP by using a digital oscilloscope hung across the IR LED, using measure cursors. I have screenshots from the scope, if that helps? I suppose I could use IrScrutinizer and the IRP to generate some UEI learns or Pronto hex if that would help - though they wouldn't be original? Interesting. Most peculiar is the modulation frequency, 75.7kHz! I do not think any such has been seen before; the ones we know are 30-56kHz (with the exception of the 455kHz ones in B&O etc). That also explains why your learning remotes failed. 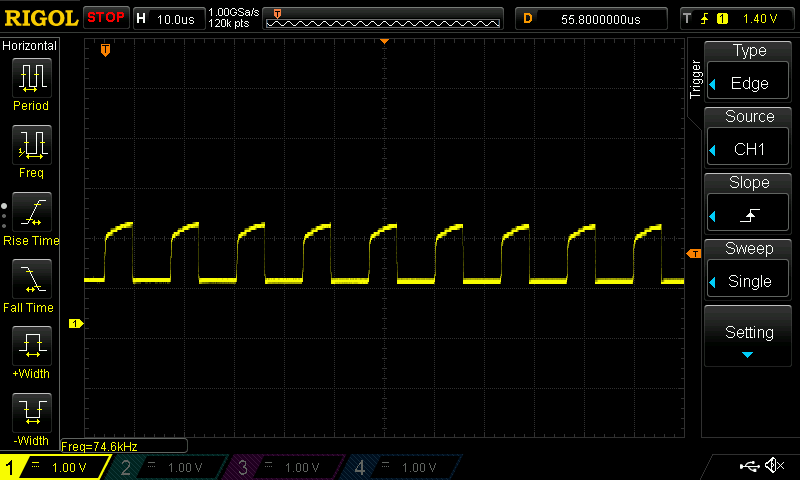 I built the IRP by using a digital oscilloscope hung across the IR LED, using measure cursors. The sending IR Led on the remote? I did get some kind of learn out of my Nevo C2, but IIRC it didn't work and was not anywhere near 75KHz. No other remote I tried managed to learn anything at all, just kept failing. Yep, the LED on the original remote. That would be D=1 S=0 F=0. Please ignore the upside-down-ness, I had the probe connected backwards. Perhaps I don't understand the time scale on the oscilloscope, but it looks to me like the period of the modulation is 500us/12.5 periods or 40us. This would be 25KHz. BTW the timescale is given by division (the grey grid squares), not for the whole screen. Multiply the timescale by 12 for the whole screen width. It seems that the modulation frequency of the original remote does vary a fair bit, this screenshot shows 74.6 KHz. Here's one approach to an executor in S3F80 format. I can't really test this since my remotes won't learn it. An IR Widget suggests that the signal is roughly correct. You'll probably need to adjust the durations, especially of the on pulses. See the Functions tab of the Manual Settings editor to see the meaning of the various CALL instructions. This executor wastes some space in the timing registers, but that was easier for me to keep track of. That S3F80 Executor doesn't work, and I can't figure out why. The LED on the reciever lights up, but it doesn't do anything. Thanks for having a go anyway. Nevertheless, I had a go at writing a HCS08 executor, cos it looked a lot simpler to do than I thought it was. This one works properly, but as far as I can tell, the output should be identical to 3FGs S3F80 executor (It's basically the same logic). BTW, I think that the protocol name should be MicroGenius, not RossMicro, as the Ross part was the UK importer - the manufacturer was TXC, and the brand was Micro Genius. I suspect that this protocol may also be used by the IR SNES and NES controllers they made. What tool are you guys using to generate these executors? I use RMIR instead of PB. I think it is faster, and executors are saved in a text file so it's easy to read. It's very helpful to me to have the various functions disassembled with a name rather than just an address. Here's a post from some time back where I described the workflow I use. Well it's the first executor I've ever written, but I used RMIR as well. I have got ProtocolBuilder but I think thats what put me off trying to write a protocol myself - RMIR's protocol editor is much nicer and less indimidating. I use PB and RM to do protocol creation. I like the documenation from a decode better in RM. I copy that to PB to start. My problem with RM and RMIR is that I take too many attempts and I make RMIR sick. I'm not as efficient as the rest of the people that do this stuff.